The first two South African educational institutions to attain University status were the South African College in Cape Town (UCT today) and the Victoria College in Stellenbosch, both in 1918. For a detailed history of the medical school please read In the Shadow of Table Mountain: A History of the University of Cape Town Medical School by J.H. Louw. The South African College in Cape Town was to host the first medical school, and in anticipation began the teaching of pre-clinical courses in Anatomy and Physiology in 1911. The first two anatomists, Robert Black Thomson (from 1911-1919) and Matthew Robertson Drennan (fro m 1913-1955), were drawn from Edinburgh, where their training in detailed comparative anatomy and human osteology were to become the research focus of the new Department of Anatomy (Tobias 1990), now the Division of Clinical Anatomy and Biological Anthropology. The first anatomy class in Cape Town was held and the first dissections were permitted under the Anatomical Act (No. 32, 1911) (Slater, 1998). Laurie Wells (1955-1972) was the chair of Anatomy at UCT after Drennan, his major interest was in non-human fauna from archaeological sites – especially those from the Middle Stone Age. He also developed an interest in the history of anatomy and published extensively on the history of anatomical illustration (Morris & Keen 1982). Wells was replaced by E.N. (Ted) Keen (1972-1985). He was primarily a surgical anatomist. Keen had some interest in osteological specimens from archaeological contexts, but his greatest interest was in the history of medicine. Ted Keen was the last clinical anatomy Head of Department. During the late 1960’s and 1970’s the number of medical students taught at UCT increased. Several new staff members were hired due to the increasing teaching load, which provided a boost to Clinical Anatomy in the Department. All of these new staff members had moved from surgical careers to the teaching of anatomy. Each brought with them research interests Charles MacClay explored aspects of embryology, Cedric Wannenburg comparative anatomy, Theunis Coetzee reproductive biology and Marcus Fredman human variation and medical education. Ted Keen was replaced on his retirement in 1985 by the embryologist Benjamin Rawdon who headed the Department until its fusion with Physiology, Cell Biology, Exercise Science, Nutrition and Dietetics, and Biomedical Engineering in 2001. At this time Clinical Anatomy expanded with the addition of Professor Graham Louw (current Head of Division), a veterinary anatomist and Maciej Henneberg (1985-1990), a Polish anthropologist with an interest in growth and human development. The expanded Department was renamed the Department of Human Biology in 2001 and the fusion of teaching and research divisions created a new synergy that has resulted in the development of new clusters of research students. The Division of Clinical Anatomy and Biological Anthropology was formed within the new Department. All permanent academic staff in the Division teach anatomy at varying levels and degrees, each member brings a unique set of skills and expertise to the Division and we try to ensure that these aspects are maximised in their teaching allocation and target courses. Several of the early traditions of Anatomy education remain active in the Division of Clinical Anatomy and Biological Anthropology today. For example, some of our anatomists are trained medical practitioners who for various reasons and at different stages of their careers have returned to the University for the vocation of education Dr. C Warton, Dr. C Slater and Dr. G. Gunston. Professor G. Louw is trained in Veterinary Science, he brings passion for understanding and studying comparative anatomy, embryology and neuroanatomy. As a Division we believe these backgrounds add dimension to our teaching and practical clinical experience is incorporated into the pedagogy of medical education at UCT. The clinical anatomists in the Division conduct research on anatomy in its traditional aspects gross, comparative, developmental, histological and neurological as applied to clinical practice. Several of our members have postgraduate higher education degrees with special interests in medical education. Dr. C Warton has an active research team and program in neuroanatomy. In 2016, Ms. K. Mpolokeng joined the Division as an Assistant Lecturer in clinical anatomy, her research in currently focused on the ophthalmic artery of the eye. Another tradition carried forward today in the Division is the focus on human osteology. This has been the primary focus of the Biological Anthropologists in the Division, starting with Prof Drennan’s research interests on the origin of southern African peoples. 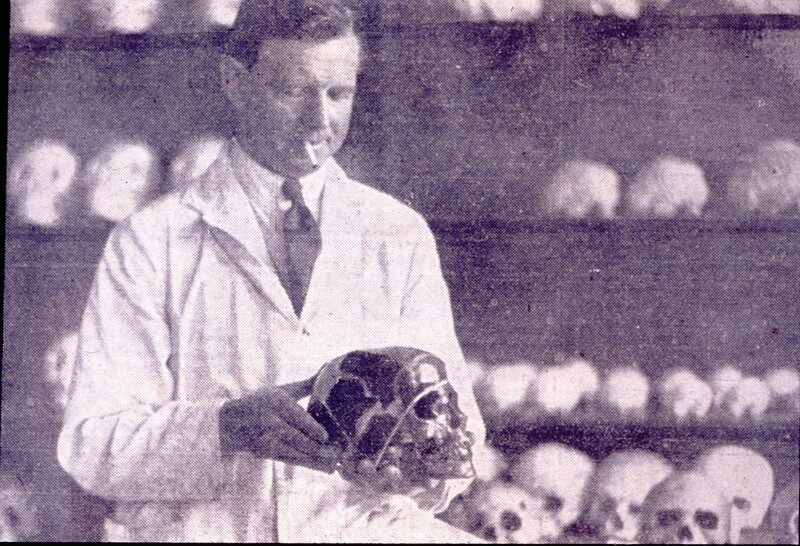 He produced the first South African textbook on physical anthropology (Drennan 1930). Drennan drew two of his junior staff members, Ronald Singer (1949) and Ted Keen (1940), into the excavations at the discovery site of the Saldanha skull at Elandsfontein, near Hopefield on the Cape West Coast. Professor Emeritus A.G. Morris (1981-2014) was and still is an active researcher in the Division. His research interests are on osteological variation in archaeological specimens. His approach is bioarchaeological rather than typological and he has worked on the origin of anatomically modern humans, and the Later Stone Age, Iron Age and Historic populations of Kenya, Malawi, Namibia and South Africa. An additional interest of his was South African history and he published on the history of race classification, the history of physical anthropology in South Africa and on the Canadian involvement in the Anglo-Boer War. Dr. J Friedling joined the Division in 2007. Her focus has been on historical bioarchaeology and forensic anthropology. In response to student interest in forensic anthropology, the Division has developed not only in terms of education and research but into a police-compliant forensic anthropology laboratory, processing forensic cases on a regular basis. In 2016, Dr. V Gibbon began in the Division as a Biological Anthropologist to replace the post vacated by A Morris. Her research is focused in bioarchaeology. The Medical Curriculum in the 1960’s and 1970’s was oriented around the basic sciences for the first three years of the programme and by 1979 it was realised that aspects of social medicine were missing from the curriculum. First year in particular remained a pure science year on the Upper Campus and there was little contact with the Medical School environment itself. The old Anatomical Science courses were re-launched in the late 1980’s which revitalised the training of post-graduate students. Morris was hired specifically to launch a new course in the medical curriculum called Human Biology. The Human Biology course of 1982 was intended to change this structure by widening the content taught in first year and to move away from the teaching of only traditional scientific material. The anthropological aspects introduced to the course included human evolution, human variation, human ecology and medical anthropology. The course ran from 1982 to 2001 when it was discontinued because of the introduction of a new integrated ‘problem based’ curriculum as currently taught. The department plays a central role in the teaching and running of the first two years of the medical programme. The digitised correspondence and research files of Drennan, Wells and Morris can be found at http://www.digitalcollections.lib.uct.ac.za/humanitec/anatomy (Morris 2015). Morris, AG & Keen, EN. 1982. Lawrence Herbert Wells and the history of anatomical illustration. South African Medical Journal 61(2):40-43. Morris, AG. 1992a. A master catalogue: Holocene human skeletons from South Africa. Witwatersrand University Press, Johannesburg. Morris, AG. 1992b. The skeletons of contact: A study of Protohistoric Burials from the lower Orange River Valley, South Africa. Witwatersrand University Press, Johannesburg. Morris, AG. 2012. Biological Anthropology at the southern tip of Africa: carrying European baggage in an African context. Current Anthropology April 2012, Vol. 53, No. S5: S152-S160. Morris, AG. 2015. Interview: Anatomy of an Intellectual Triad – the records of UCT Medical School Anatomy Division. Humanitec Digital showcase 2011 - 2014. Curated and digitised by the Humanitec/UCT Libraries initiative. University of Cape Town. Phillips, H. 1993. The University of Cape Town 1918-1948: the Formative Years. Cape Town: University of Cape Town Press. Singer, R. 1955. Race, Biology and Genetics. NUSAS Lecture Series 1955. pp.55-69. Local Studies Council, University of Cape Town. Slater, CP. 1999. A professor, a student and a criminal. South African Medical Journal 89(3): 254-258. Tobias PV. 1990. The role of R.B. Thomsom and E.P. Stibbe – brief heralds of the science of anatomy in South Africa. South African Medical Journal 78: 330-430.